With the presence of a large pool of participants, the global personal protective equipment market is displaying a highly competitive business landscape, finds a new research report by Zion Market Research (ZMR). Alpha Pro Tech Ltd, 3M Company, Uvex Safety Group, and Du Pont are some of the key vendors of personal protective equipment across the world. These players across personal protective equipment market are focusing aggressively on innovation, as well as on including advanced technologies in their existing products. Over the coming years, they are also expected to take up partnerships and mergers and acquisitions as their key strategy for business development, states the personal protective equipment market study. Reportedly, Corvex Connected Safety, a worker-driven IoT safety tool, and BEworks, a leading management consulting organization, have entered into strategic partnership for improving worker safety as well as workplace accountability for the firms. The former makes use of smart PPE & sensors to offer real-time safety information for avoiding workplace accidents. As estimated in this report, the global personal protective equipment market stood at US$ 39.37 billion in 2016. 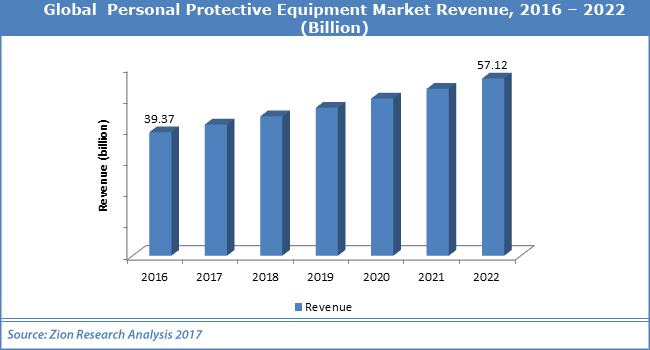 Witnessing a tremendous rise during the period from 2016 to 2022, the revenue in this personal protective equipment market is expected to reach US$ 57.12 billion by the end of the forecast period. The main products available in this market are protective clothing, face masks, helmets, hand gloves, protective footwear, Goggles, respiratory protection equipment, hearing protection device, and other head, eye & face protecting equipment. Among them, the demand for hand gloves is relatively higher and the trend is anticipated to remain so over the next few years, notes the personal protective equipment market research report. “Escalating product use in oil & gas, construction, pharmaceuticals, manufacturing, chemicals, transportation, and food sectors is projected to favorably leverage the growth of personal protective equipment market in the years ahead,” says the author of this personal protective equipment market study. Apart from this, risks of accidents for the workers involved in the activities such as land clearing, digging, blasting, trenching, and boring will further stimulate the business sphere. In addition to this, strict government legislations forcing the firms to comply & abide by the factory laws pertaining to employee safety have further catapulted the demand for personal protective equipment. Pricing pressures and surge in product commoditization, however, can adversely impact the growth of personal protective equipment market in the near future. Nevertheless, rising awareness among employees regarding safe & secured working conditions is projected to help the personal protective equipment (PPE) business flourish over the next few years, thereby normalizing the impact of hindrances on the industry, reports the personal protective equipment market study. Regionally, Europe has been leading the worldwide personal protective equipment market and is anticipated to continue on the dominant position in the years to come, states the personal protective equipment market study. Growing concerns pertaining to occupational hazards & safety and the greater requirement for protective gears in metal manufacturing, automotive, and oil & gas sectors is the main factor behind the dominance of the Europe personal protective equipment market.